Sri Lankan diaspora is a vibrant and active segment in their host countries, making contribution to their adopted nations while providing monetary and intellectual support to their homeland, says Prof. Patrick Mendis, renowned public policy scholar in an interview with Dr. Sadananda Sahoo, Editor, Roots and Routes. Professor Mendis, you have been a well known scholar of public policy and published many scholarly works, how do you find the role of diaspora in general and Sri Lankan diaspora in particular in the global political economy? Diaspora initiated its roots ever since people began to move from one place to another; then in the later centuries, a wide range of explorers, warriors, and preachers accelerated this process—now we called “Glocalization.” (In 2005, I authored a book, Glocalization: The Human Side of Globalization, for which the late Sir Arthur C. Clarke wrote the foreword). Now people leave their homelands for a variety of reasons, including economic, political, religious, and ethnic persecution. Since the Eelam-War began in Sri Lanka in1983, an increasing number of people, mostly Tamils, immigrated to other countries—largely as refugees. As a whole, the Sri Lankan diaspora is a vibrant and active segment in their host countries, making contribution to their adopted nations while providing monetary and intellectual support to their homeland. Like with any diaspora, the Sri Lankan communities—both immigrants and expatriates—enjoy greater economic, political, and diplomatic influence on public policies of their homeland. In my view, the role of diaspora has a transformational effect for a better world in the midst of chaos and tension. We have heard that the Sri Lankan diaspora has played both positive as well as negative role in Sri Lanka. Do you think there has been better engagement with Sri Lankan diaspora in recent times? The Sri Lankan diaspora has primarily and historically viewed as a positive force. Until the early 1980s, a small number of diaspora communities, especially in the West, began their journey involving in intellectual pursuits. In recent decades, the politically active Tamil communities (and the new generation of millennials between age 18-33), particularly in Europe and Canada, have begun to find new pathways to contribute to their host nations professionally while influencing diplomatic and political processes in homeland. I think that the Sri Lankans as a “community” has a special DNA to succeed in foreign lands because Sri Lanka has historically engaged in international affairs and exposed to other cultures and people. This ancient tradition seems to prevail among all communities of Sri Lankan origin. How do you think the religion and geographical locations (both Home Country and Host countries) play role in diaspora engagement? For example, Buddhism is a predominant part in mobilizing Sri Lankan diaspora. Similarly the socio, economic, and political role played by Sri Lankan diaspora living in Europe (advanced economy but far away) in contrast to Asian countries (developing economy but geographically close). This enduring tradition is still taking place around the world in various forms; in the United States, a network of Buddhist temples from New York to California and Minnesota to Texas provides a valuable service not only to the Sri Lankan faith communities but also to other groups as well. For instance, another revered family friend, Venerable Dr. Bhante Gunaratana, the founding abbot of the Bhavana Society in the mountainous West Virginia, is a modern day force-for-good in our troubled world as he and other trained monks run regular meditation sessions and Dharma talks to a range of Buddhist and non-Buddhist constituencies in the United States and around the globe. Geographically closer to homeland, the pioneering Buddhist revivalist Anagarika Dharmapala, along with Colonel Henry Steel Olcott of the American Civil War (1861-65) and Madam Helena Blavatsky (a Russian) of the Theosophical Society, promoted the Dharma in India primarily, and then expanded to Europe and North America. The Sri Lankan-born Dharmapala, the founder of the Mahabodhi Society, contributed enormously to preserve the bedrock of Buddhist legacy in Varanasi and Sarnath—two Indian pilgrimage sites of Uttar Pradesh in the midst of surrounding Hindu population. Proximity to Sri Lanka, the Hindu population in the Tamil Nadu Pradesh has somewhat different relations with the island. With the beginning of the Eelam War, the Sri Lankan Tamil people engaged with Tamil Nadu in numerous ways; the most significant aspect is now related to the sensitive refugee issue and its politics of bilateral relations with Sri Lanka. The displaced Tamil diaspora living in India had historically enjoyed powerful ethnic connections to the Tamil Nadu Pradesh that seems to play out in federal politics. This perennial nexus is magnified by the expanding networks of Tamil diaspora in other countries, especially in the West. Collectively the global diaspora remains a vigilant force to find justice to the Tamil people in the post-Eelam Sri Lanka. For example, New Delhi’s central government actions at the UN Human Rights Council have largely been influenced by political considerations in Tamil Nadu and the plight of displaced Tamils in India and elsewhere. How do you differentiate or equate Sri Lankan Diaspora with other South Asian diaspora in terms of their economic and political engagement with the home country? Well, compared to the other South Asian diaspora, Sri Lanka is often associated with higher education and professionalism in the United States. They have actively engaged in arts, culture, medicine, engineering, business, philanthropic, and every other imaginable field. Like any other diaspora communities, the Sri Lankans provide economic benefits to their homeland with direct remits to their families and projects. A group of young volunteers, for example, in The Educate Lanka Foundation (ELF)—a tax-exempt non-profit organization in Maryland—has been sponsoring scholarships to underprivileged students in Sri Lanka since the devastated Asian tsunami. (For full disclosure, I am serving as the founding chairman of the ELF board of advisors). Similarly, there are many other groups—like the Sri Lanka Foundation in Los Angeles—working towards a better homeland. In recent years the role of high skilled or knowledge diasporas are evident in facilitating the home country engagement in global platforms through lobby and other means and vice versa. Do you think Sri Lankan diaspora is successful? Yes. With instant communication, the Sri Lankan diaspora is fully engaged with affairs in homeland. Since many members of this diaspora are highly educated and relatively wealthy (with disposable income), they have the intellect and resources to mobilize and influence policies globally and locally. For example, the Tamil diaspora—especially in Canada, England, and Europe—has successfully lobbied their host country governments to engage in the UN Human Rights Council’s resolutions in Geneva for alleged human rights violations reportedly occurred at the end of the Eelam-War. The countervailing forces were also activated by the pro-government emissaries and others in public protests and global media campaigns. This illustrates the vibrant nature and sophistication of the Sri Lankan diaspora in action for greater justice. Finally, I would happy to know the wonderful work done by your team in bringing out an Encyclopedia of Sri Lankan Diaspora. What were the major challenges in bringing out this multidisciplinary work? This was a multi-year project involving over fifty distinguished experts on Sri Lanka and the diaspora studies around the world. 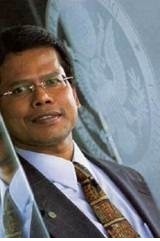 Under the visionary leadership of Ambassador Gopinath Pillai, the chairman of the Institute of South Asian Studies (IASS) at the National University of Singapore, our international panel of advisors in The Encyclopedia of Sri Lankan Diaspora worked primarily on the intellectual and academic side of the project. The Ambassador and his team have had their own challenges of financing and coordination among experts and the subject matter specialists. Luckily, this team had an extraordinary experience in producing the first Encyclopedia of Indian Diaspora. Given the sensitivity, we in the academic side often spent more time to ensure the accuracy and objectivity of the study. In my particular case of researching and writing the Sri Lankan diaspora of the United States, I have encountered a range of numerous obstacles related to the lack of official data in the Sri Lankan immigration to the United States because the earlier years the US Census data combined with other South Asian groups. But I have benefited from a huge network of various Sri Lankan communities in the United States and Sri Lanka who provided valuable assistance, information, and photos for the Encyclopedia, for which I am very grateful. Indeed, it was a collective endeavor.